This coastline sentinel stands magestically in a beautiful, blue sky. 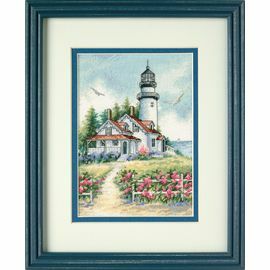 A combination of Cross and Half Cross Stitch achieves the realistic color shading. Kit includes: 18 count white Aida, cotton thread, needle, and complete instructions. Kit contains cotton thread, 18 count white Aida, needle, and easy instructions.